Eddie Leon was accorded All-American honors at both Tucson High School and the University of Arizona. He played professional baseball for more than 11 years, eight years in the major leagues. He played five seasons with Cleveland, two years with the White Sox and finished his career in 1975 with a brief appearance with the New York Yankees. 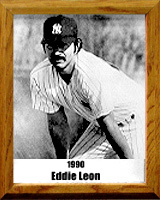 Leon was an All-American at the University of Arizona for three consecutive years before going into pro ball. He was recognized as one of the best defensive players in the major leagues as a shortstop.